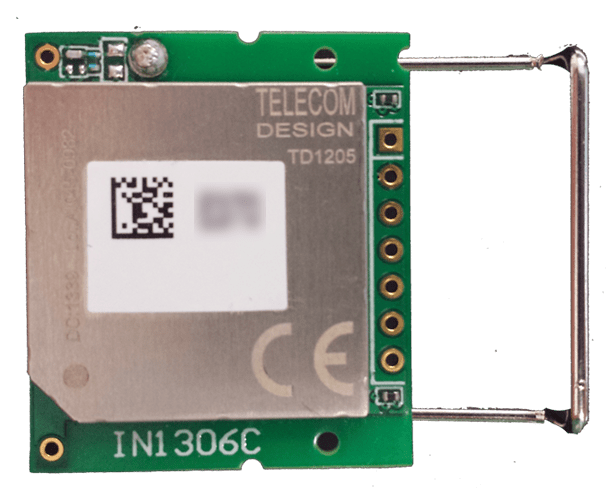 The TD1205 device is more than the usual Telecom Design Sigfox embedded circuit as TD1204 and TD1208, they are a all in one chip providing GPS antenna and RF antenna. Ready to use, to be clear you just need to plug a battery to use it. I really think this design is the best product of TelecomDesign for a quick SigFox design in many cases because it makes you ready with all the hardware stuff. The device is prevalidated by Sigfox so you have a small risk to miss the certification tests and the built-in RF antenna is compact and efficient. More over, the device transmission power has been boost compared to other chips. So you’ll get a better coverage for an equivalent antenna. The main problem with that chip is TelecomDesign is not really ready to sell it … sounds funny ! By-the-way, discussions with avnet and Telecom Design looks like different on this topic and at the end, if you not plan to buy 100K devices it is not clear what you can do with the product. Personally I really regret this unclear position as a such device is a really good starting point for any product needing a sigfox adapter. The TD1205 is like a TD1204, not the form factor but the content plus the GPS & RF antenna. The form factor is a square which is more easy to embed. It has GPS & accelerometers like the TD1204. To develop with a TD1205, it starts to be a problem. The device is not part of the SDK and even if really near a TD1204, you will crash it if you try to load a TD1204 binary. The TD1205 SDK is not delivered by TelecomDesign. Even if they were a great help to me to compile sample code I do not assume it is the right way to proceed. I hope Telecom Design will reconsider the TD1205 positioning. Some other small differences make TD1204 code not portable : 2 leds, the standard one is active low (which was not my default on my design). The accelerometer that seems to be implemented differently and was bugging initially on my code. Not big issues but requiring some interactive discussion with TelecomDesign to make it running. So as a conclusion, I thank Telecom Design for its help to design a prototype I hope I’m ready to use on a real context for my next product experiments but, I’m a little bit disappointed about what I think to be the most interesting product to kickstart a Sigfox project but that limited by the marketing approach. I do not know what will be the success of this product, but frankly speaking, if I had to make 100K devices in a time I would build my own platform myself. If I need 1K – 10K I would prefer to buy this one. This entry was posted in IoT, Sigfox and tagged hardware, IoT, SigFox, td1205, telecom design. Bookmark the permalink. -est-ce que la puce TD1205 peut nous donner les coordonnées GPS préalablement demandé en commande AT ? Mon but est de l”utiliser avec un arduino pour lui faire envoyer des données sur le réseaux sigfox, notamment la position GPS mais aussi d’autres informations..
Vous pouvez me répondre par mail, (j’ai d’autres informations à vous demander sur Sigfox non relatif à l’article). Hello, the td1205 have a modem firmware as the other chip. You can use it with an arduino and you can get gps coordinates from it. The main issue is the commercial approach : I’m not sure you can buy it. Hello, I have an idea for a SIGFOX application and I would like to make a demo system on short term. I would like to get in contact with you. I am currently working on a TD modem and I am facing an issue regarding emission. When I am connected on my EVB, I have a success rate of sending near 90% but when I am working on a coin cell, the rate is below 50%. My understanding is that the cell lacks of power to support the charge pick. I am though considering use a bigger cell but I was wondering if you have tricks that could work. For example, I don’t understand the redundancy criteria in SigfoxSend function. Can the device be sure that the message was received? Thank you for past help and for your help on this topic! Hello Jean, I do not thing using a cell battery is a good idea, the sigfox module needs 45mA during 8 second for a transmission it is something difficult to manage for a such battery. It may be possible to find some way to make it works but I’m not a analog circuit expert. (But if you find a way, please share). I assume it is why your success rate is decreasing. The redundancy is the number of time the same frame has been received. Normally when a message is sent on sigfox, it is send 3 time on 3 different frequencies. Basically if you have no noise of concurrent emission on the same frequency the redundncy is 3 ; most of the time, some of them are lost .. I have the same issues with the accelerometer , what is the solution? I´m an engineer student and I´m working on a GPS tracker using TD1205 module and I have some questions for you. Could you please contact me on email?